The Philadelphia Flyers joined the National Hockey League (NHL) in 1967, along with five other teams, to double the league from six to twelve teams. They have enjoyed a lot of success since, including being the first expansion team to win the Stanley Cup. They won back-to-back cups in 1973–1974 and 1974–1975 and would qualify for the Stanley Cup Final six more times. The Flyboys have left their mark on the NHL through their physicality, which helped them garner the nickname "Broad Street Bullies." 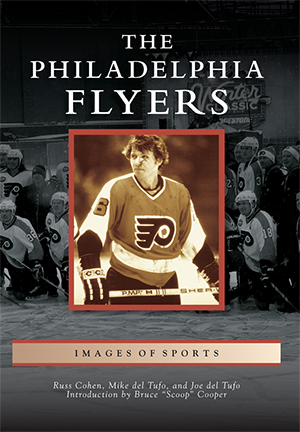 This book is a pictorial history of the Flyers that examines their modern history and looks back at their legend. This book is a collaboration of Russ Cohen, Mike del Tufo, and Joe del Tufo. The trio previously worked together on the book The Winter Classic—The NHL's Savior. Russ Cohen is an accomplished writer for sportsology.com, Beckett hockey, and CSNPhilly, as well as the author of several hockey titles. Mike del Tufo covered the Flyers for 17 years, writing and reporting for several publications including Center Ice Hockey magazine. Joe del Tufo is a professional photographer based in the Philadelphia area who has covered the Flyers for over a decade.